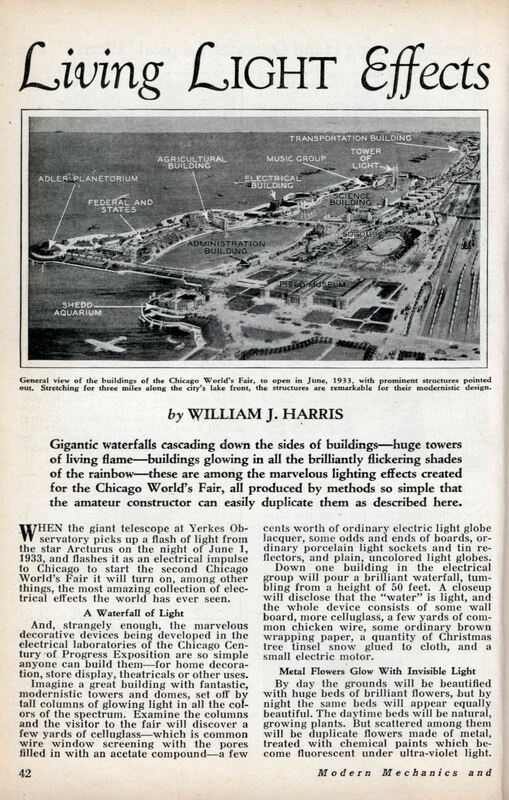 Gigantic waterfalls cascading down the sides of buildingsâ€”huge towers of living flameâ€”buildings glowing in all the brilliantly flickering shades of the rainbowâ€”these are among the marvelous lighting effects created for the Chicago World’s Fair, all produced by methods so simple that the amateur constructor can easily duplicate them as described here. WHEN the giant telescope at Yerkes Observatory picks up a flash of light from the star Arcturus on the night of June 1, 1933, and flashes it as an electrical impulse to Chicago to start the second Chicago World’s Fair it will turn on, among other things, the most amazing collection of electrical effects the world has ever seen. And, strangely enough, the marvelous decorative devices being developed in the electrical laboratories of the Chicago Century of Progress Exposition are so simple anyone can build themâ€”for home decoration, store display, theatricals or other uses. Imagine a great building with fantastic, modernistic towers and domes, set off by tall columns of glowing light in all the colors of the spectrum. Examine the columns and the visitor to the fair will discover a few yards of celluglassâ€”which is common wire window screening with the pores filled in with an acetate compoundâ€”a few cents worth of ordinary electric light globe lacquer, some odds and ends of boards, ordinary porcelain light sockets and tin reflectors, and plain, uncolored light globes. Down one building in the electrical group will pour a brilliant waterfall, tumbling from a height of 50 feet. A closeup will disclose that the “water” is light, and the whole device consists of some wall board, more celluglass, a few yards of common chicken wire, some ordinary brown wrapping paper, a quantity of Christmas tree tinsel snow glued to cloth, and a small electric motor. By day the grounds will be beautified with huge beds of brilliant flowers, but by night the same beds will appear equally beautiful. The daytime beds will be natural, growing plants. But scattered among them will be duplicate flowers made of metal, treated with chemical paints which become fluorescent under ultra-violet light. Huge ultra-violet projectors playing across the flower beds at night will pick out the artificial flowers, and make them glow in all the brilliant coloring of the real specimens by day. Fantastic floral and decorative designs on building walls and columns will be painted in the same way. Hidden lights in various colors, the light values rising and falling as the resistance values in the lines are automatically changed, will sweep bands of color across the columns, then, as the lights fade out, the ultra-violet projectors will pick out the fluorescent designs. Towers of dancing flame are being prepared, and again the celluglass, some half cylinders of glass, partly frosted with liquid frosting, some rags of red silk, an electric fan and plain lights turn the trick. The red silk, dancing in the breeze from the fan, provides the illusion of flickering flames. The huge false windows of the transportation building, each window more than sixty feet high, will appear at night as a kaleidoscope of dancing colors. Hidden between the glass of the window and a false background will be projectors carrying several colors of lights, playing on a background studded with nails, on each nail hanging a four-inch square of polished aluminum, while electric fans at the base cause the metal squares to vibrate and reflect moving light beams. The buildings of the huge exposition, which will stretch for three miles along the Chicago lake front, are remarkable because they are quite unlike those of any other fair ever staged. They represent the last word in modernistic architecture. Instead of the built-up carved and plaster effects of the so-called “classic” architecture of the famous Chicago fair of forty years ago, there will be huge expanses of plain, unadorned surface, painted in brilliant colors, which, at night, by the use of lights in various colors as well as ultra-violet projectors, will appear to shift constantly through a wide variety of colors and shades. Sixteen thousand kilowatts is the estimated connected load when the lights go on next June. Cables are being provided, however, to carry more than that amount, to care for additional effects that may be developed. Now for the story of how some of the effects are builtâ€”a system so simple it can be easily copied for other purposes. Glowing columns of light, explained in detail in one of the accompanying drawings, are easily made. The celluglass, which costs approximately eight cents per square foot, comes in yard widths. These are bent, the edges overlapped slightly, and wired to form a cylinder. The cylinders, cut in different lengths, are painted with ordinary lamp bulb color lacquer. With the quantity production necessary for the fair dipping vats are used. A paint brush can be substitutedâ€”but experiments with spraying were a failure, as it was impossible to get an even coating. Several cylinders can be mounted on one base, or each can be provided with a separate wooden disc for base, and a tin shield bent around it, coming high enough to hide the lamp and reflector. A top, either of tin or wood painted black, cuts off the light without causing reflections which would produce a bright spot. wire, half-inch square mesh, is mounted to revolve on a fixed shaft of half-inch gas pipe, the light wires being led in through the shaft, as shown. Around the cylinders inch-wide strips of common brown wrapping paper are wound spirally, spaced an inch apart. A small electric motor is belted to a pulley on the base of one cylinder, and a crossed belt provides a drive from this to the second cylinder. 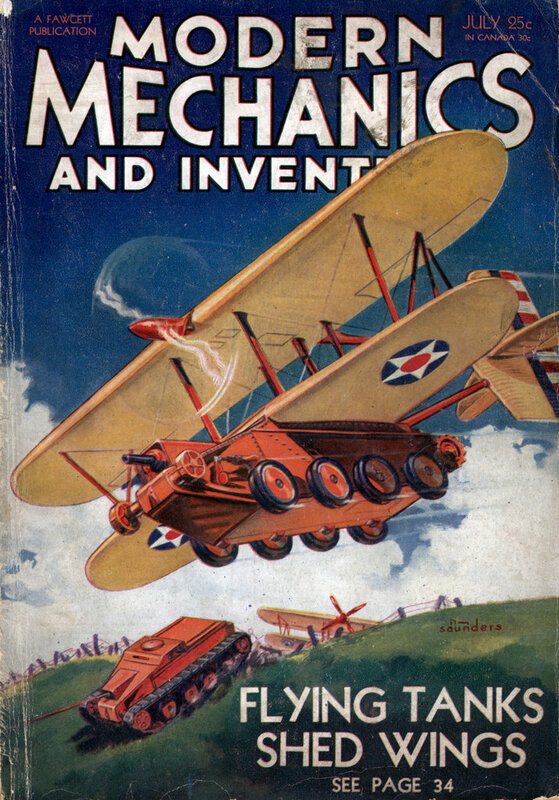 The motor should be geared down so the cylinders revolve at approximately 40 to 60 r.p.m. As the cylinders revolve the bands of light escaping between the paper spirals sweep downward across the tinsel snow, giving the illusion of falling water. One of the more expensive effects is the tower of flame. Its cost is due to the use of real glass semi-cylinders, although celluglass could be substituted, with some loss in the effect. A cone of celluglass is placed inside the tower to break up air current eddies which would form at the step backs in the sides. The red silk, suspended from the top of the cone and secured at the base, gives a very realistic effect. Another illustration shows a novel application of the “edge light” principle used to some extent in signs. Two light tubes, one filled with neon and the other with mercury vapor, are mounted at the center of a hollow column. The mercury tube is used to kill the harsh red light of the neon, the two together giving a soft rose glow. In slits in the column surface two strips of common double – strength glass four inches wide are mounted, three inches apart and parallel. Two smaller strips of glass, frosted by sand blasting on the inner side, are mounted at 45-degree angles to close the gap between them, as shown. The inside of the column is painted a dead black. So long as the inside is properly black and the tubes are placed in the exact axis of the column no light can escape through the plain glass sides of the projecting ornaments. Only the frosted edge segments pass light, as shown in the shaded portions, and the resulting effect is that of a sculptured Grecian column, with glowing rose light substituted for the corrugations of the marble. The combination of mercury and neon tubes will be general throughout the fair, the illuminating engineers considering the resulting soft rose color more attractive than the harsh red of the neon alone. One of the unusual effects being developed is a series of modernistic “trees” with trunks and branches of shifting changing light. Wallboard “V’s” will be mounted vertically against building walls. At the point where the two sides meet vertical slits a few inches wide will be cut, backed with glass, and then closed up the center, as shown in one of the. drawings, with narrow strips to divide each slit into two parts. Branches, formed in the same way, will project at right angles, turning up to form “L’s”. Inside the “V” a neon and a mercury globe, mounted back to back on a shaft connected to an electric motor, will slowly revolve. From the outside the trees will change color constantly, from red to rose to blue to rose and back to red again, depending on whether one tube is facing the surface, or both are transmitting a portion of the light. The same idea, it has been suggested, might be applied to a modernistic Christmas tree, formed of three tall triangles of wall board, joined to form a triangular pyramid, with the trunks cut in the center of each side, and branches radiating toward the corners, as the sketch shows. One of the unusual effects being developed provides dimming control for neon and similar tube lights. Red, blue and green lights will be mounted in alcoves along the wall. Carbon pile dimmers will make it possible to produce practically any color by dimming and mixing the three primary shades. Existing boulevard lamp standards, lining the park drives in Grant and Burnham parks, the area included in the exposition grounds, are to be brought into harmony by adding modernistic decorations to the lamp standards. A half dozen different types of decorations have been developed to be mounted around the large globes on top the standards. Inside illumination of the exhibition spaces is to be entirely artificial, so that each exhibitor can control the lighting of his display to the best advantage. The lighting fixtures of the booths, and the corridor lights and illuminated signs will all follow the general scheme of modernistic decoration. Marvels of the World’s Fair are by no means confined to the lighting designs. All of the buildings are interesting not only for the modernistic nature of their architecture, but because they have been* so erected that when their temporary purpose has been served, they can be pulled down and the building materials salvaged for other purposes. Practically the entire Fair is built on ground reclaimed from Lake Michiganâ€”made land. Not all the buildings are temporary; the huge Field Museum, the Adler Planetarium, and the Shedd Aquarium are permanent structures which may almost be regarded as units of the Fair. Perhaps the most unique of all the structures is the Railroad building, illustrated in the photograph on page 45. It is notable for its dome-roofâ€”a huge expanse which is not supported by walls or pillars from below, but which hangs suspended from steel cables. This construction eliminates entirely all need of supports which would otherwise be required in the floor area, and enables the architects to take advantage of the largest unobstructed area ever enclosed by man beneath a roof. It represents the first important application to architecture of the principle of support used in the suspension bridge. The dome is 200 feet across and 125 feet above the floor. As will be gathered from a study of the photograph, the supporting cables have the appearance of a giant spider web. I can’t find the old page 3. It defaults to the full version of the typing of the article on page 3, and I’d like to get a copy of the Original page 3….